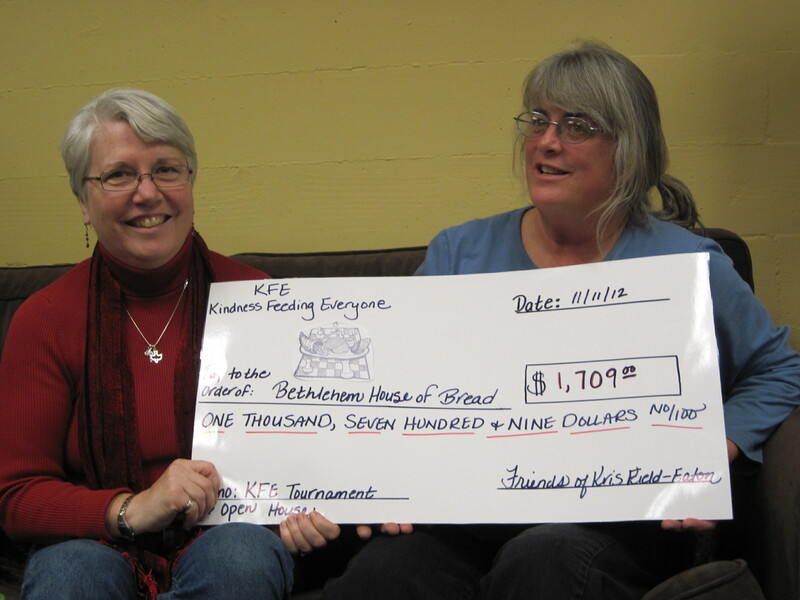 Linda Dove, director of Bethlehem-House of Bread (L) and Kris Field-Eaton accept a check for $1709 from the KFE tournament. It wasn’t the usual tournament space. When 93 players arrived at the first annual KFE tournament in Tigard on Veterans Day, they found a church in the process of being converted to a community center. They found a new food pantry (and donated 425 pounds of food to its stores). And they found the beginnings of a new tradition. KFE stands for Kris Field-Eaton, who has been a part of the chess community for many years and helped to found many chess clubs in Sherwood and Tigard. It also stands for “Kindness Feeding Everyone,” and the proceeds from the tournament added up to a donation of $1709 for the community center/food pantry.